Mitral regurgitation (MR) is understood to be an unusual reversal of blood flow from the left ventricle (LV) to the left atrium (LA). It’s caused by interruption in any area of the mitral valve (MV) equipment. The most common etiologies of MR contain MV prolapse (MVP), rheumatic heart disease, infective endocarditis, annular calcification, cardiomyopathy, and ischemic heart disease. 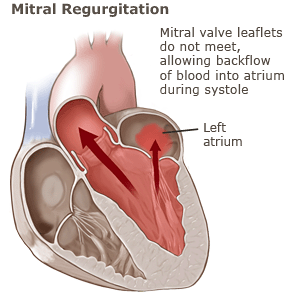 Mitral regurgitation (MR) happens when the mitral valve doesn’t close correctly, causing the strange leaking of blood from the left ventricle during the mitral valve and back to the left atrium when the left ventricle contracts. Intrinsic lesions influence 1 or several elements of the mitral valve. Together with the decreased incidence of rheumatic fever, degenerative MR is now the most common cause. Acute MR may result from papillary muscle rupture, infective endocarditis or trauma. Secondary MR may be due to idiopathic cardiomyopathy or ischaemic heart disease (when it is also called ischaemic mitral regurgitation). The managing of asymptomatic patients is contentious but operation may be an option in selected asymptomatic patients with acute MR. 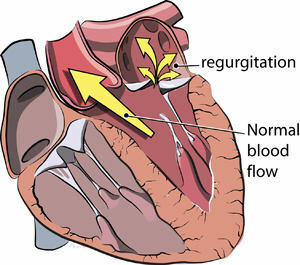 Surgery is indicated in patients with indications of LV dysfunction. When operation is proper, early surgery (ie within two months) is connected with better results, because the development of even mild symptoms by the time of surgery is associated with unfavorable changes in cardiac function after surgery. In MR, first treatment choices contain nitrates, diuretics, sodium nitroprusside, positive inotropic agents and intra -aortic balloon pump. When heart failure has developed, angiotensin-converting enzyme (ACE) inhibitors should be considered in patients with advanced MR and serious symptoms, who aren’t appropriate for operation or have residual symptoms following surgery. Beta blockers and spironolactone are also proper. In certain asymptomatic patients, it has been revealed that severe MR can be safely followed up until symptoms develop or advocated cut-off values for LV dysfunction are reached. Such direction demands attentive and regular follow up. Asymptomatic patients with average MR and preserved LV function may be followed on a yearly basis and echocardiography should be performed every couple of years. Asymptomatic patients with acute MR and maintained LV function should be found every six months and echocardiography performed yearly. Urgent surgery is indicated in patients with acute severe MR.
Rupture of a papillary muscle needs urgent surgical treatment after haemodynamic stabilisation with the intra-aortic balloon pump, positive inotropic agents and, when possible, vasodilators. Valve operation includes valve replacement usually. Surgery is indicated in patients with acute long-term main MR who have symptoms due to chronic MR, but no contraindications to operation. Valve repair is considered to be the preferred operative treatment in patients with severe MR. When repair isn’t possible, mitral valve replacement with preservation of the subvalvular equipment is preferred. The single process that has been valued in organic MR is the edge-to-edge procedure, which has revealed a success rate of about 75%. It is comparatively safe but reduces MR less effectively than mitral valve operation and recurrence or worsening of MR is prone to happen during follow-up.